What a difference a summer can make. 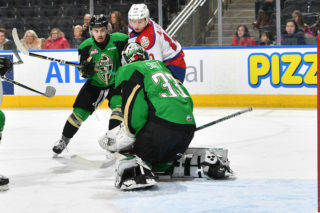 After a last place finish in 2017-18, the Edmonton Oil Kings (4-0-0-0) remain undefeated to start the 2018-19 campaign following a 5-0 win over the Swift Current Broncos (0-3-0-0) in front of 4,467 fans at Rogers Place on Friday night. 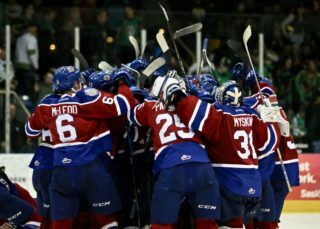 It marks the first time in modern franchise history that the Oil Kings have started a season with four straight wins. It was also a night to remember for 17-year-old goaltender Boston Bilous (2-0-0-0), who needed just 15 saves to follow up his first career WHL win in last Friday’s season opener with his first career WHL shutout tonight. 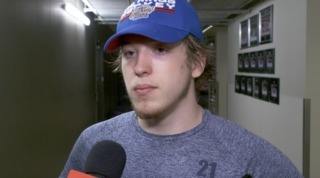 It marked the first shutout by an Oil Kings goaltender since Patrick Dea turned aside all 27 shots he faced in a 3-0 win over the Kootenay ICE (coached by then head coach Luke Pierce) on November 12, 2016. 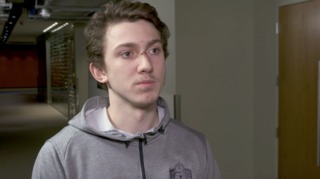 Joel Hofer (0-3-0-0) was the much busier of the two goalies tonight, giving up five goals but making 42 saves. It’s been tough sledding for the Broncos since coming off last year’s Ed Chynoweth Cup victory, as the defending WHL champions have scored just one goal in three games this season while surrendering 15. The early season offensive dominance of Trey Fix-Wolansky, Vince Loschiavo and Brett Kemp continued on Friday, as Fix-Wolansky registered his third three-point game in four contests, while Loschiavo tallied his third multi-point game and second two-goal game of the young season. Loschiavo’s five goals tops the league in that category, while Kemp sits tied for second with four. Fix-Wolansky leads all WHL players in both points (9) and assists (8). Ethan Cap opened the scoring with his first goal of the season, wiring a one-timer past Hofer to make it 1-0 Oil Kings at 17:14 of the first period, from Loschiavo and Fix-Wolansky. Just over a minute later it was 2-0 Oil Kings as Kemp notched his league-leading fourth goal of the season, from Quinn Benjafield and Carter Souch at 18:20 to send the game into the first intermission. After a slow start by the home side, they led the Broncos in shots through the opening frame, 13-10. Approaching the midway point of the second period, the Oil Kings corralled the puck in the Swift Current zone as Fix-Wolansky fed Loschiavo with a tape-to-tape, cross-ice pass. 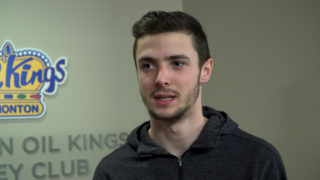 The overager Loschiavo buried his fourth of the season – also a perfectly fired one-timer – tying Kemp for the league-high mark in goals, at the time. Conner McDonald earned the secondary assist on the 3-0 goal at 9:17. Patience paid off for Vladimir Alistrov as he deked Broncos’ defenceman Billy Sowa at the hashmarks, danced through the slot and outlasted Hofer for his first career WHL goal to make it 4-0, Edmonton. Scott Atkinson picked up the lone assist at 13:51. The Oil Kings 30th shot of the night came on the power play and it was another beautifully placed one-timer executed flawlessly by Fix-Wolansky with the assist, and Loschiavo with his second goal of the night. Jake Neighbours picked up the second assist at 16:16, which closed out second period scoring with the Oil Kings leading 5-0. 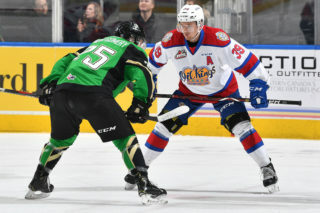 After 40 minutes shots were lopsided heavily in Edmonton’s favour, 34-12, including a 21-2 margin in the second period of play followed by 13-3, Oil Kings in the scoreless third. Swift Current finished the night going 0-for-2 on the power play while Edmonton was 1-for-5 with man advantage. Boston Bilous (EDM) (3), Trey Fix-Wolansky (EDM) (2) and Vince Loschiavo (EDM) (1) were selected as the Three Stars of the Game. Winger Jalen Luypen dressed in his first career WHL game, while defenceman Matthew Robertson was honoured in a special pre-game ceremony for his gold medal winning performance at the 2018 Hlinka Gretzky Cup last month. The Oil Kings are back in action tomorrow, Saturday, September 29 when they travel to Calgary for a meeting with the Hitmen at 7:00 PM (MT). Their next home game is Wednesday, October 3 when they host the Saskatoon Blades for a 7:00 PM (MT) start.